The second ParallelShow took place in the Naturalis Biodiversity Center in Leiden, the Netherlands. 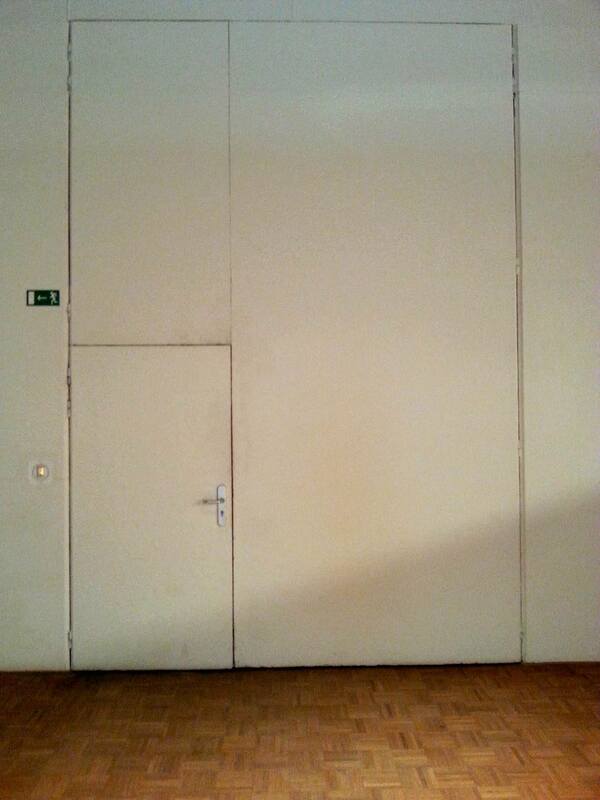 The choice of location might be a bit unexpected because it is not an art place. It is a museum for visual encounters with life in all sorts and that in itself seemed a very good reason to choose it for the ParallelShow. 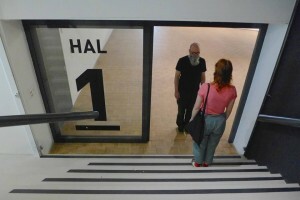 Another new aspect was the number of participating artists. We were six: Peter Baren, Jeroen Bouweriks, iwbdjdyatmvezdmnekzawvb, Mr and Mrs Gray and Frans van Lent. We walked together in a line through the corridor, from the central hall towards the exhibition building. During this walk we immitated the (electronic) bird-whistling coming out of the loudspeakers above us. We then started to explore the museum individually. After 90 minutes we gathered in the restaurant and discussed the possibilities. 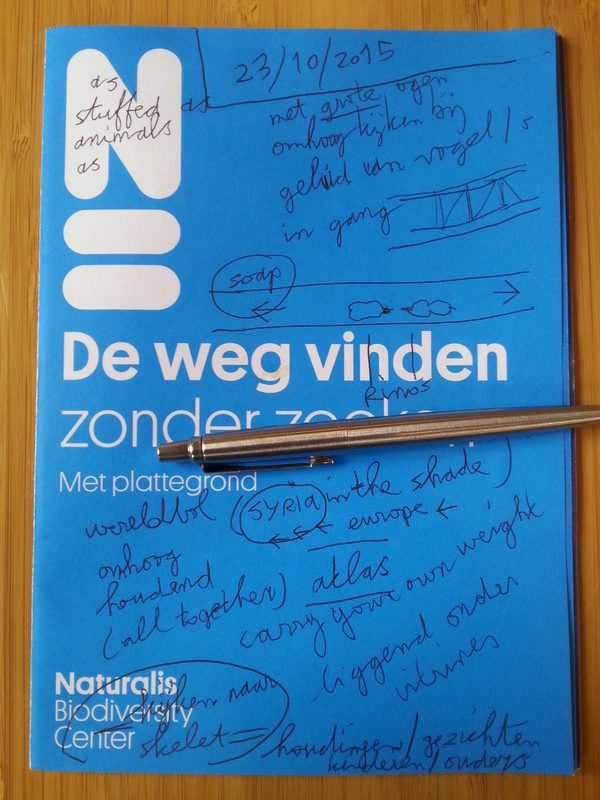 Many ideas came up, some were chosen to work out. The most distinct aspect was the number of parents with young children. The museum seems to be designed specifically for this targetgroup. The exhibited objects are presented not only to look at, but also to touch and to physically manipulate. 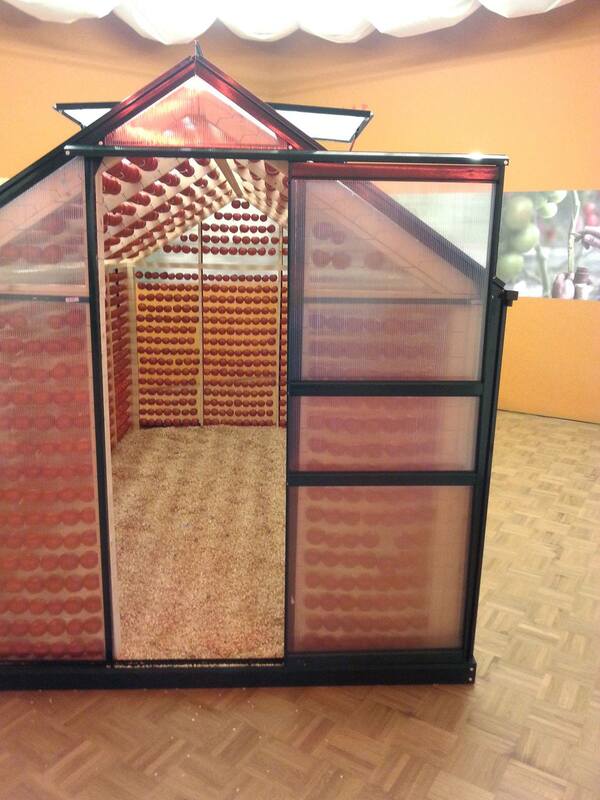 The museum is mainly focused on interactivity, on making the experience as vividly as possible. Another aspect was the fact that every exhibited species is dead and stuffed, nothing moved of its own accord, all sounds came out of loudspeakers. This museum, dedicated to life in its broadest sense, only showes man-made immitations and dead animals. The visitors are learning about life by studying death. There was a tendency of (some) parents to withdraw into a state of lethargy in the background while their children were enjoying the attractions. By doing that they seemed to more or less approach the condition of the stuffed animals. It created a certain mirroring and we decided we could join them in doing that. Another concept was the devise of a lost child. Malou made up a 5-year old girl called Malina. ‘Malina wears blue jeans and a yellow t-shirt, applicated with a white elephant. She has long brown hair’. 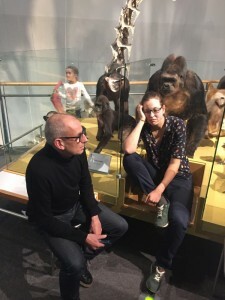 Malou reported the missing girl, together with Jeroen, to the staff of the museum, and by doing that she created an official search for this unknown living creature in the museum. This activity related to the adventurous searches organised to entertain the visiting children. – One was a training in patience by queuing where ever we found possibilities to queue. 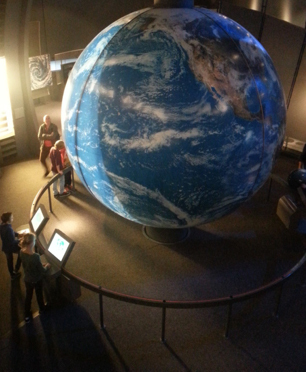 – And the second was a group-action of slowing down (stopping) for a short moment the 4 meter big globe in the geographical department. A staircase that goes down to a sliding door. On the other side the Tomatenfabriek exhibit. 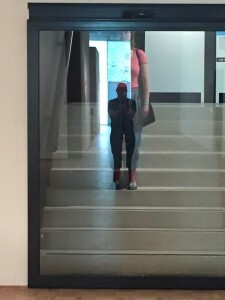 Person A takes a position on the stairs. A approaches the sliding door. A stops walking when the sliding door opens and continues after the sliding door has closed. Person B takes a position on the stairs when person A has moved to the other side of the sliding door. Both A and B approach the sliding door from opposite sides. A and B stop walking when the sliding door opens, and continue after the door has closed again. 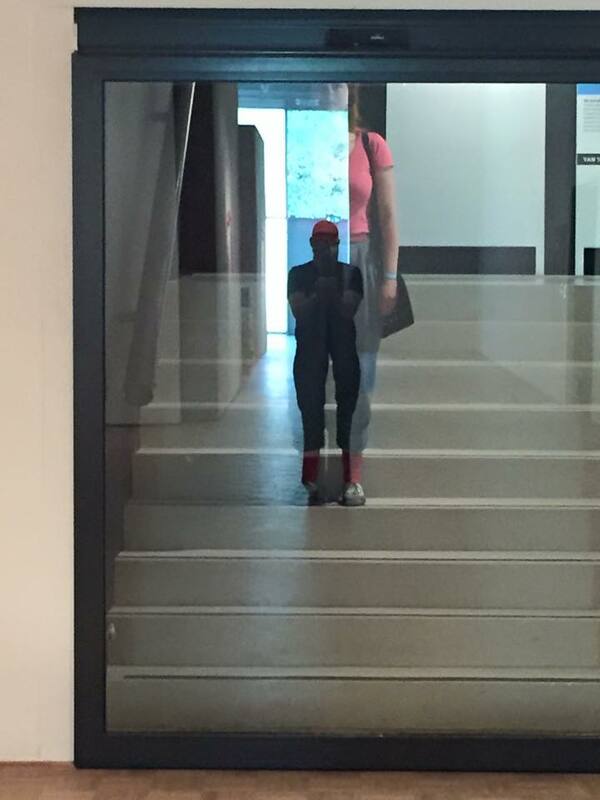 Person C takes a position on the stairs when B has moved to the other side and A has left. B and C approach the sliding door from opposite sides. B and C stop walking when the sliding door opens and continue after the door has closed again. After C enters the exhibition space B leaves. For a while C approaches the sliding door from the opposite side, stops when the door opens, and continues after it has closed. Stay close to the wall on your right side. Walk until you are back where you started. Each time when you approach an automatic door, hold your step until the door is wide open, and then continue walking through the door. Visit the museum’s Door Exhibit. 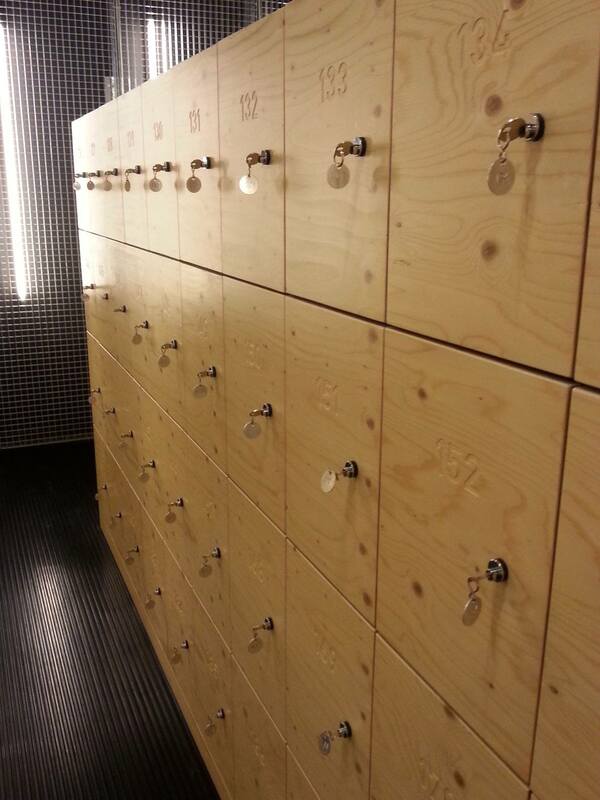 Choose your own route but focus solely on the doors that you can find in the museum. You can shoot photo’s of the exhibited doors. Reflections on performing the three ideas. 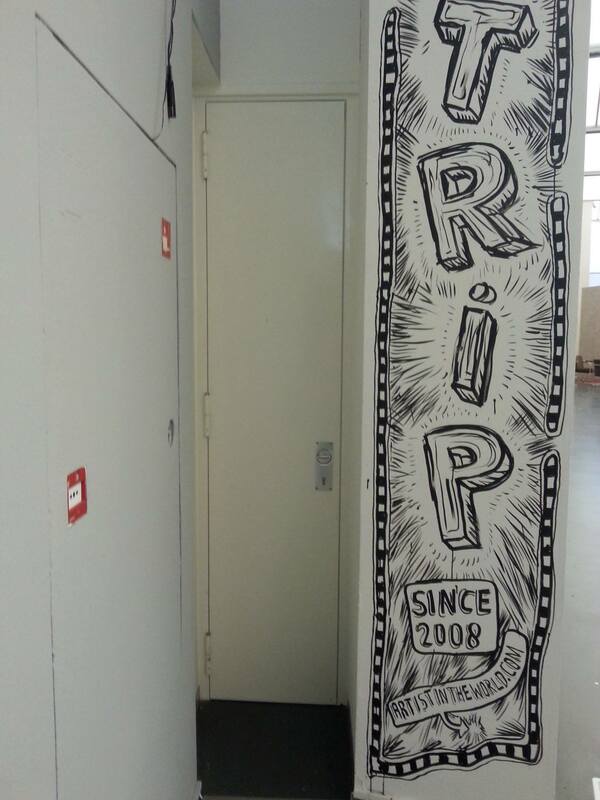 Sliding Door was an interactive piece. 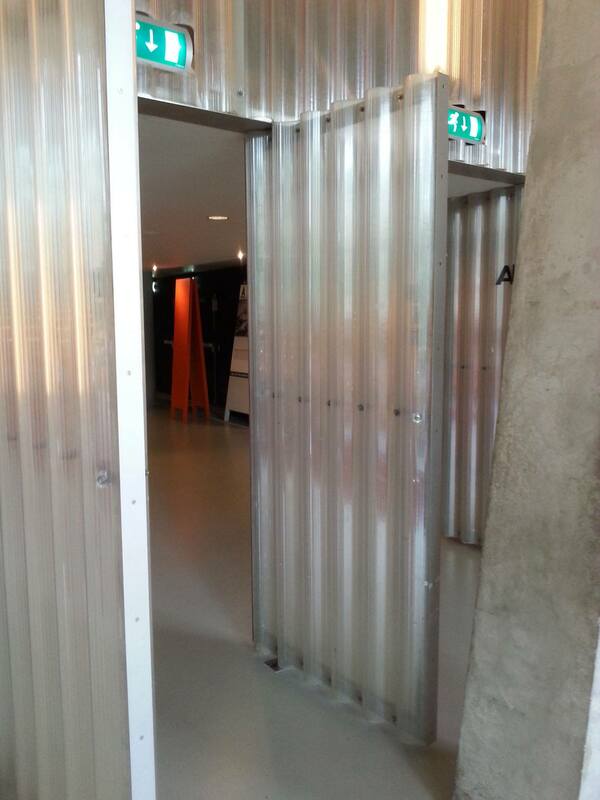 The sliding door’s detector responds to the performers’ movements. The performer responds to the door’s movement. And two performers on opposite sides of the door also influence one another while activating the sliding door. 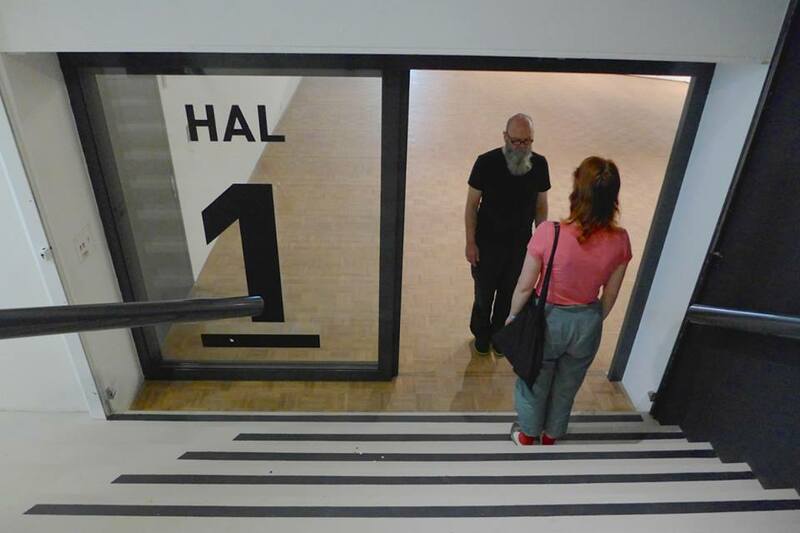 Frans started the action and I noticed that in addition to walking forward down the staircase he also occasionally moved a few steps back. During my turn I decided after a while that I would go only forward. I was excited to find out that I could come so close to the door despite the many times I to had to hold my step. As I neared the door I could only take one step at a time before it would open. Finally, as I stood directly in front of it, the door would no longer open on its own, and a museum staff member helped me by swinging his arms in front of the detector until it opened. But I was not able to move before it closed again. Then a large group of visitors showed up behind me and I decide to no longer block the entrance. I walk into the exhibition space with them. 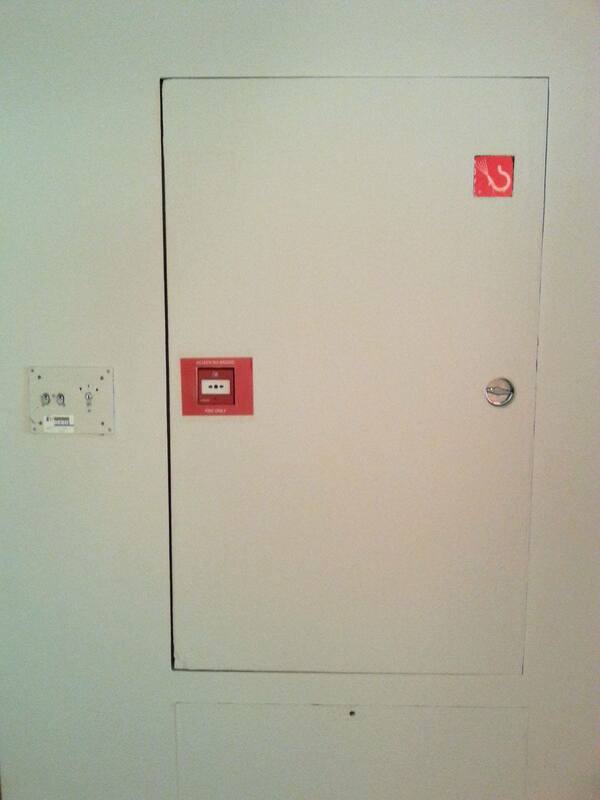 While visiting the Door Exhibit I was surprised by the multiplicity and variety of the doors in the museum. 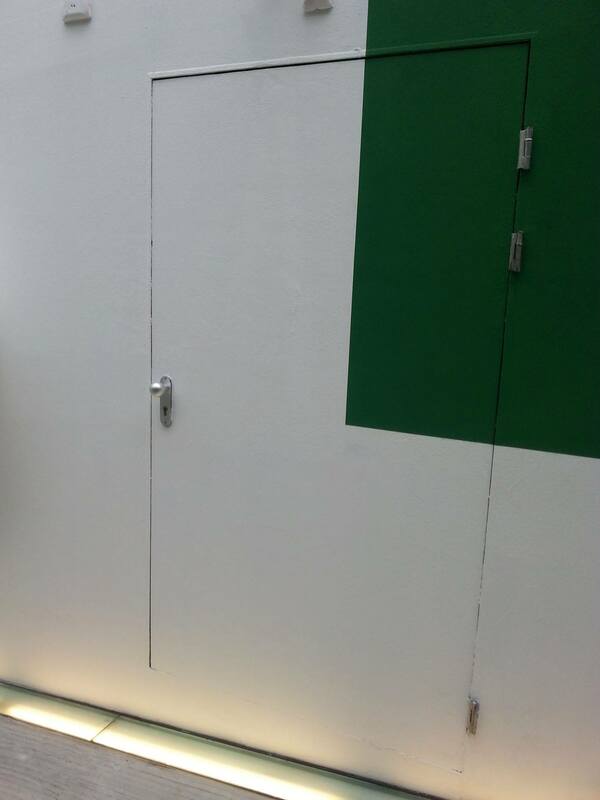 There were doors used by visitors, doors used as emergency exits, doors that were part of the exhibition furniture, doors for staff members, hidden doors, toilet doors, elevator doors, closet doors, locker doors, doors with exceptional shapes, locked doors, electronic doors, doors displaying information, and open doors. While photographing some of the doors I attracted the attention of a security guard. Feeling nervous about my activity, the guard asked me what I was doing. I told him that I’m visiting the Door Exhibit. There is no door exhibit he explained. I said that after visiting the Do it exhibit, which was the present exhibition at the museum, I got inspired to write my own instructions and then to perform them. 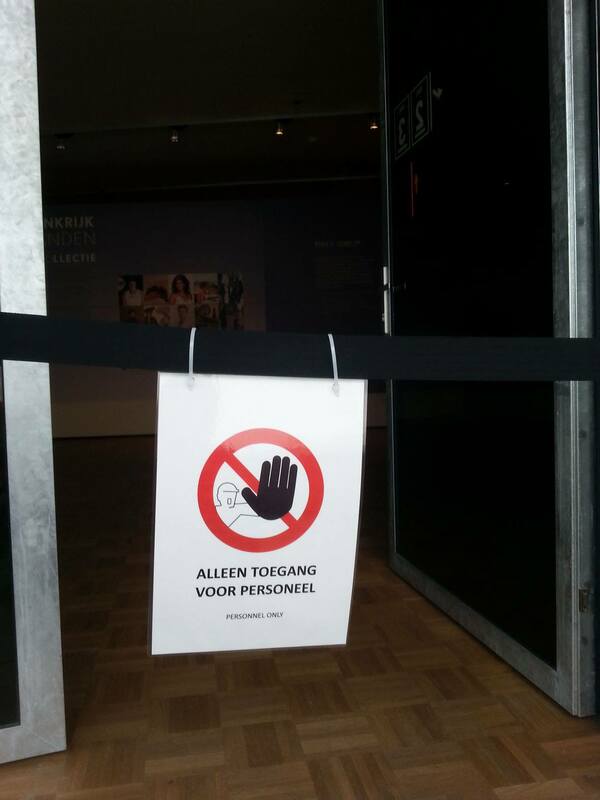 As I explained this to the guard I didn’t consider the sensitivity of the subject of doors to the museum’s staff. In 2012 there was a robbery of 7 paintings, including works by Monet, Gauguin, Matisse and Picasso. To get in and out the thieves used the emergency exit. The paintings were never returned. It has been said that the mother of one of the burgulars destroyed them in an oven in Romania. Performing Follow the wall on your right side produced a similar experience to performing the Door Exhibit. Because it put one’s focus on something other than works of art on display, it exposed a new dimension of the experience of visiting exhibitions. 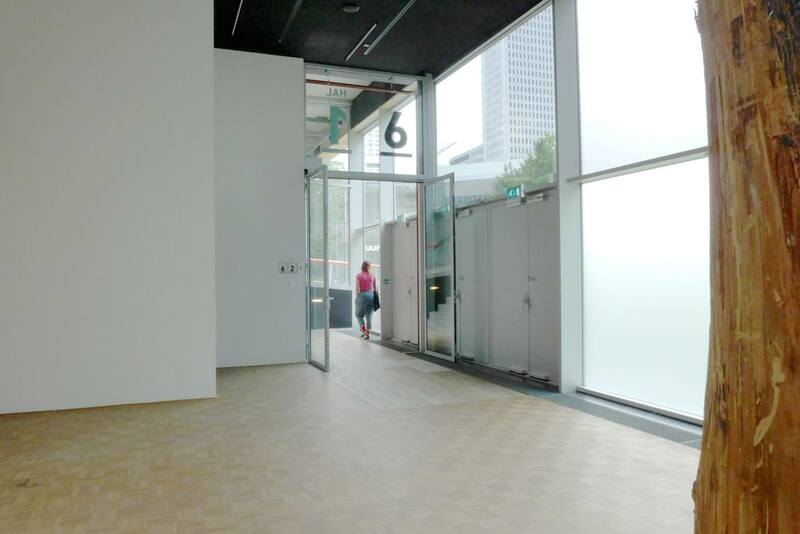 It was surprising to find that by continuously following the wall on your right side you automatically pass through all of the exhibition spaces. At some points the walls are huge, empty, and white. At other points you pass by large windows that for a moment introduce the street and the park into your visual experience of the museum’s interior. 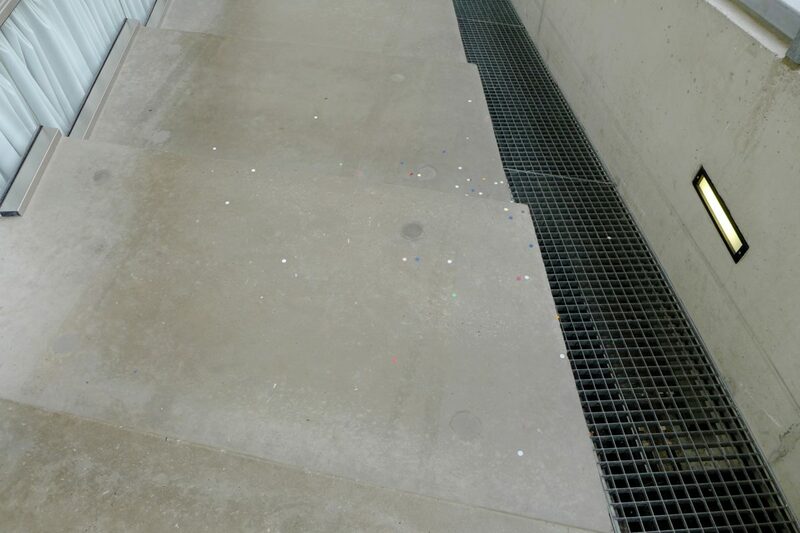 When I visited the Do it exhibit earlier that day, confetti that is part of the show had been swept together on the floor in front of a wall. It looked beautiful and colorful. 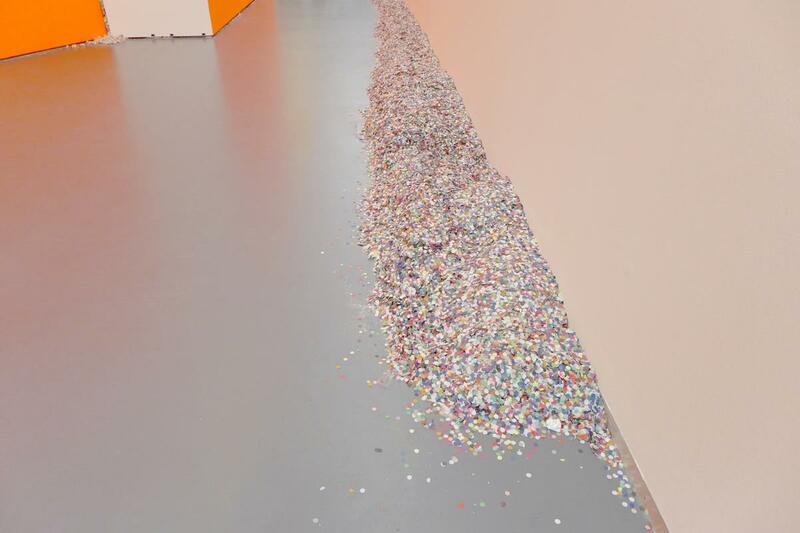 When I reentered the same exhibition while I was following the wall on my right side, security guards just had barricaded the space around the confetti to prevent visitors from playing with it. 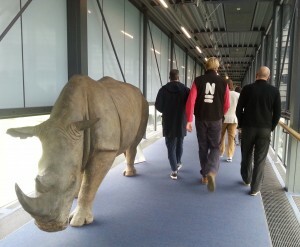 We started to (individually) visit the shows at the Kunsthal. That took about 90 minutes. After that we gathered at the restaurant and discussed the experiences and possibilities. Every one of us came up with a personal concept and all were meant to be carried out by all three of us (as a group or seperately). Not one of the concepts did actually respond to any aspect of the visited shows. They were related to the architectural qualities of the building, and mainly to a certain aspect of the building: the doors. We were not sure what this actually meant. 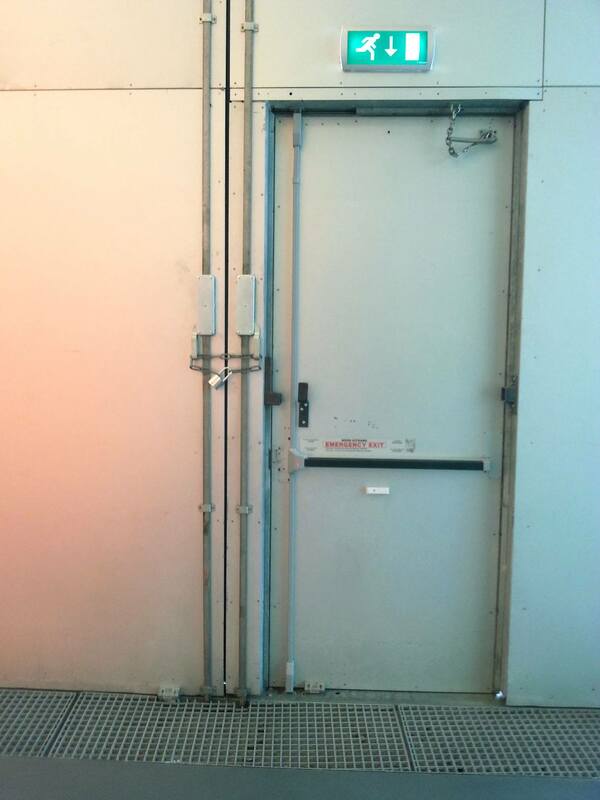 One of the possibilities is that doors are related to a performative aspect of a building: the moving around. And moving around in spaces was what we were doing and what we are basically interested in. It could also mean that we distanced ourself from the exhibitions. The show Do-it is mainly about performing of course, but this particular show was probably not the best presentation of Obrist’s concept. And maybe it just came too close and we could not distinguish ourselves enough from the work, needed to do this more radically by simply ignoring it. 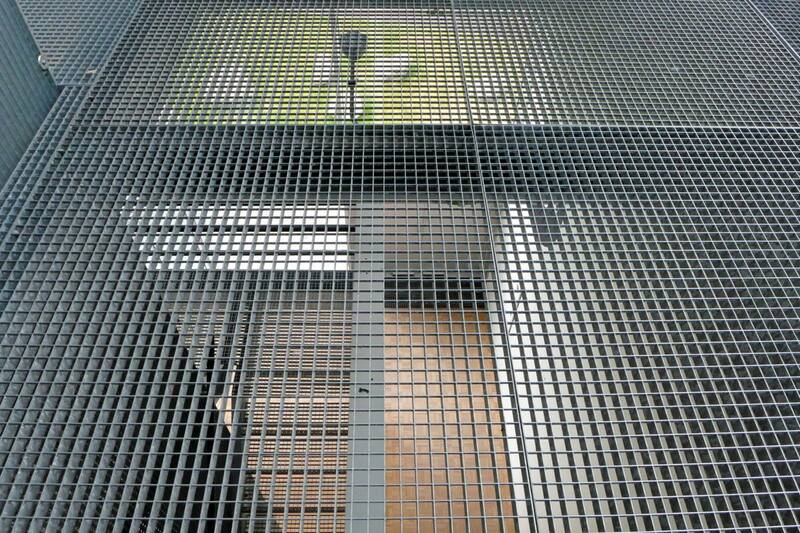 A descending staircase ending in a sliding door. Behind the sliding door an exhibition space. The first person goes down. The door closes, the person turns around and goes up again. This repeats a number of times till the person decides it is enough. The person then walks on through the opened door. (his place at the staircase will now be taken by a second person). 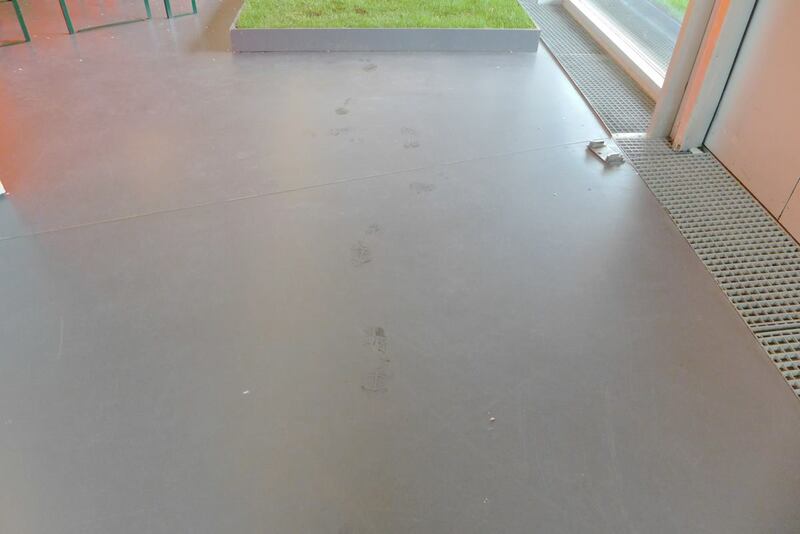 After going through the opened door the person walks a number of steps into the space. The person then turns around and walks back towards the sliding door. When it opens the person stops. The door closes, the person walks backwards away from the door. When the door opens the person stops again. The door closes, the person starts walking forward towards the door. 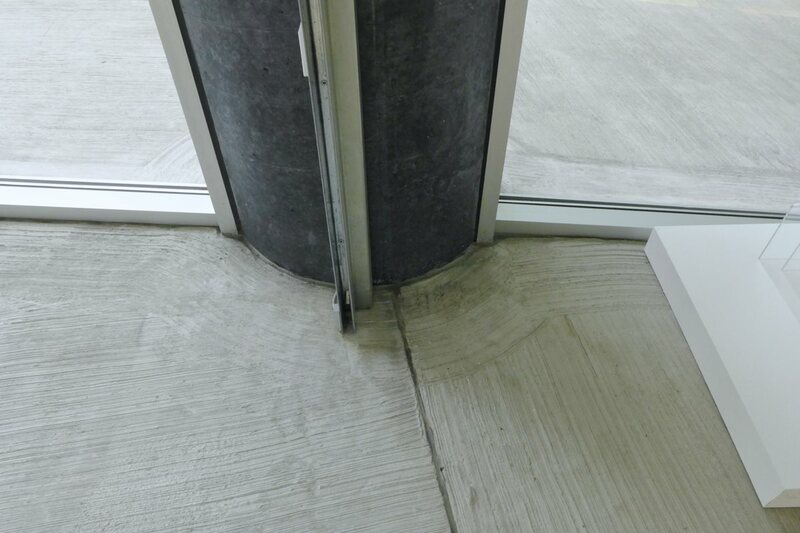 The only interactive moving part in the architecture is the sliding door. It opens and it closes when somebody approaches. The performer mirrors this action by walking forward and backward in response to the movements of the door and by that (indirectly) in response to the movements of the second performer and to other people entering or leaving the exhibition.